A standard treatment Reiki energy flows from the practitioners hands into the client in a non intrusive way. The client will be lying on a massage table on their back but treatments can also be given while the client is seated or even standing. The client remains fully clothed. The practitioner places his hands on or near the clients body in a series of hand positions. These include positions around the head and shoulders, the knees, and feet. Each position is held for three to ten minutes depending on how much Reiki the client needs at each position. There is no massage or manipulation. The whole person is treated rather than specific areas. Sessions can take between 45 minutes to an hour, depending on the client’s needs. Comforting when life is tough – The relaxing nature of Reiki can be very helpful to people especially at difficult times in our lives. We can all feel overwhelmed or disconnected, sometimes there is a real sense of isolation, both emotionally and spiritually. Reiki treatments can bring feelings of peace, centeredness and an ability to cope better with the challenges of life. 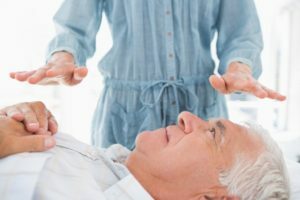 Reiki can be beneficial – in circumstances that are short term, but can also support people dealing with long-standing conditions, helping to bring comfort, acceptance and a more positive outlook. Supportive during pregnancy – Reiki can be wonderful for pregnant women. Treatments can be very relaxing and enjoyable for the mother.